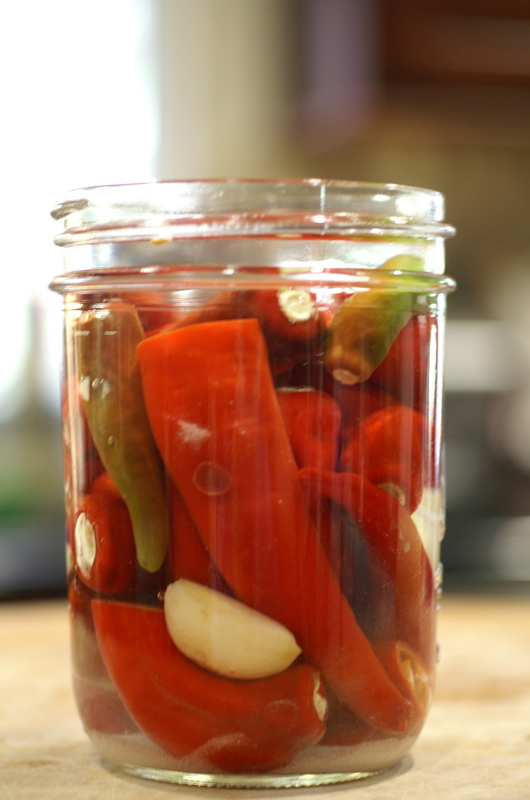 Peter Piper picked a peck of pickled cayenne peppers. A peck of pickled cayenne peppers Peter Piper picked. 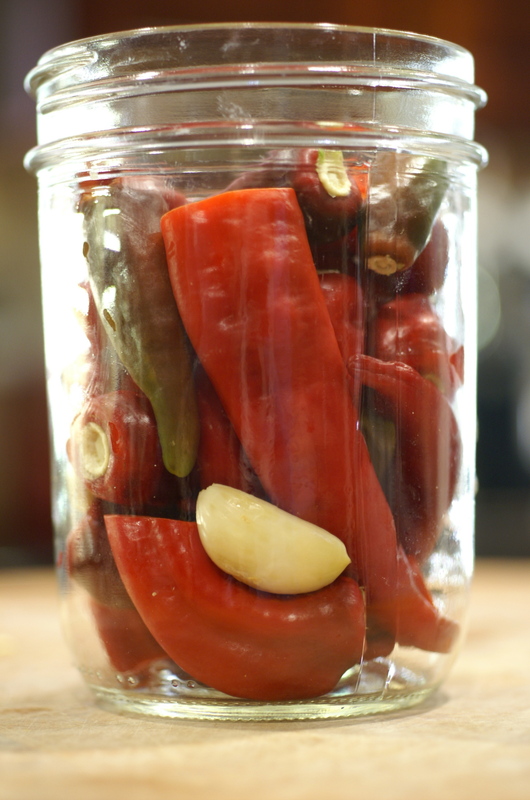 If Peter Piper picked a peck of pickled cayenne peppers, where’s the peck of pickled cayenne peppers Peter Piper picked? He made hot sauce, that’s where. but they are the ones we have the most difficult time using and I refuse to waste them. I had toyed with the idea of drying and powdering them but that seemed such a waste. Then it dawned on me. We use a fair amount of hot sauce so why not make our own. So off to the internet I went trying to find a good hot sauce recipe. Everywhere I turned I found all sorts of recipes for cayenne chiles and vinegar. People claimed this was the same as Dave’s Insanity Sauce. Although it was tempting I wanted something that was aged. So I thought a little more and figured if I could brine cucumbers to make pickles then why couldn’t I brine cayenne chiles and make a hot sauce? 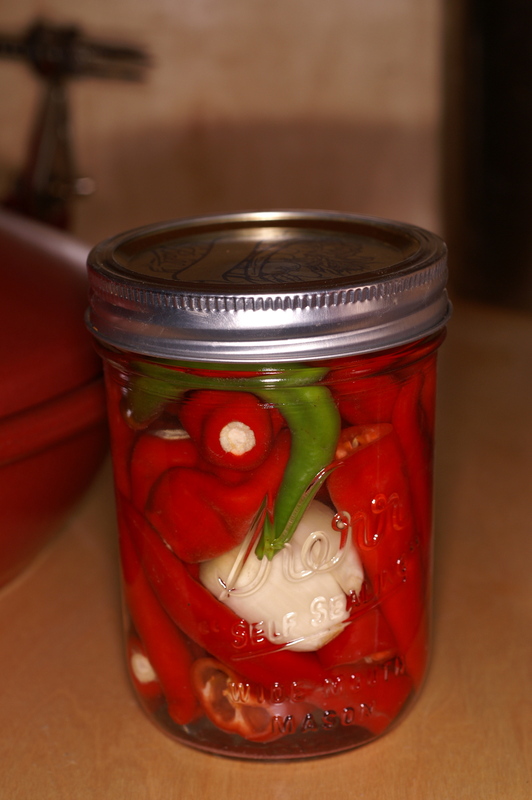 The lactobacilli bacteria would give the peppers a nice tang and the peppers would keep their heat. Add a little garlic for additional flavoring. Why not give it a try? So I did and the results are in. This produced a delightfully flavorful hot sauce. It’s very vibrant. It has a touch of natural sourness from the fermentation process; nice saltiness from the brine; and a nice bold flavor and kick from the cayenne peppers. Surprisingly, however, it’s not very spicy. Store bought Tabasco sauce has more spice to it. Nonetheless, this has incredible flavor, similar to Louisiana Hot Sauce. 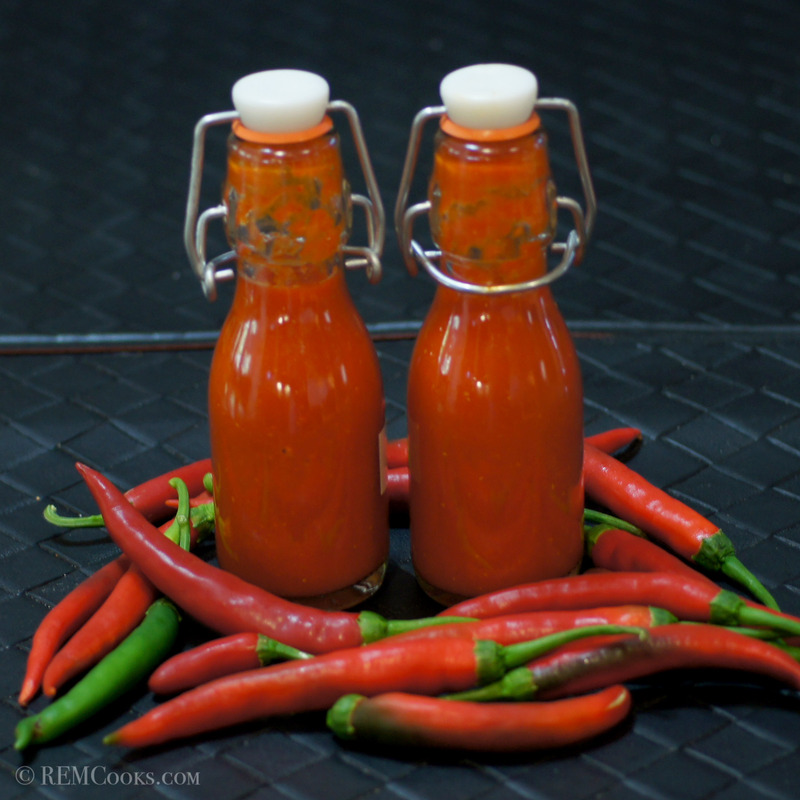 So if you’re looking at trying your hand at making a natural hot sauce, give this a try. Please note that there are 3 updates to this recipe because I keep tinkering with it. So, read all of the way through. This sauce is really fabulous. While some of our readers may think this is rocket fuel, this really aint rocket science. First, sterilize a 1 pint jar and lid. 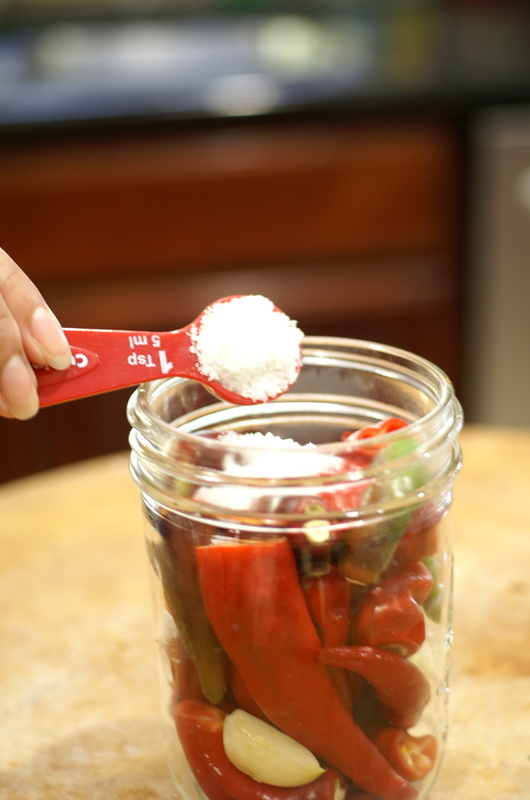 Add the cayenne peppers and garlic to the pint jar filing it as best you can. 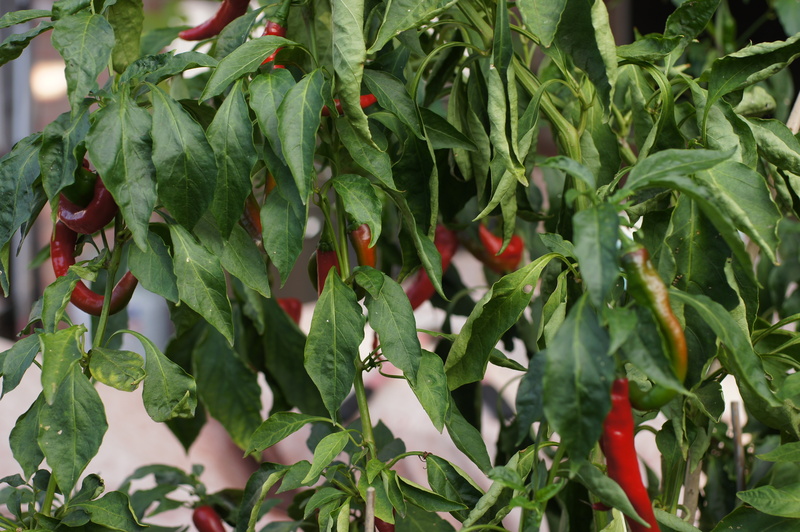 Cover the cayenne peppers with bottled spring water or water filtered through reverse osmosis. Now, some of you are asking why bottled water? Well my friends, tap water contains Chloramine to prevent disease causing bacteria and pathogens. Chloramine (as CI2) is formed when ammonia is added to water containing free chlorine. So if you remove the chlorine, the ammonia stays. This will inhibit the production of lactobacilli bacteria and create other issues when you pickle something. So don’t use tap water. If you must use tap water, add 1 tsp white vinegar to the brine to help “kick start” the fermentation process. Place lid on top and tighten securely. Place in a cool (68 – 75 F), dark place. Now, here’s the hard part. LEAVE IT ALONE FOR 2 WEEKS! 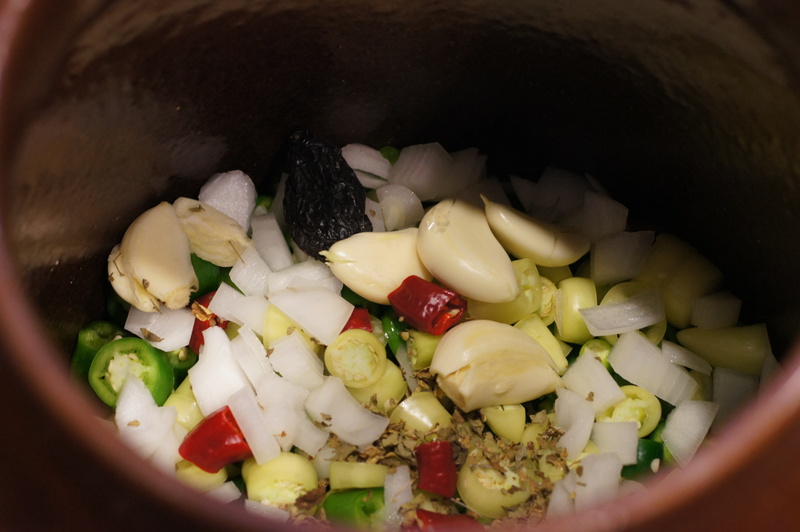 After 2 weeks have passed, place chiles, garlic and brine in a blender and blend at its highest speed for 1 minute. Pour into cute jars for later use. I have since made 2 more batches of this stuff and gave it away as Christmas gifts. As you can see, one batch was another red hot sauce and the other was green. After the first batch, I tried another batch using the same basic ingredients EXCEPT I got more chiles, cut them into 1 inch thick rings, added 12 dried chile de arbol for some added heat, added a couple more garlic cloves, used a 1 Qt jar, made a brine using roughly 3 cups water and 2 Tbsp salt, poured the brine over the chiles until covered, placed a weight on top of the chiles to keep them submerged, put the lid, ignored it for 2 weeks, ran it through the Vita-Mix and strained it. The results were wonderful! It had considerably more heat, was thicker and had tons of flavor. Notice the 1 little red cayenne. He was lonely all by himself. 😉 Now, all we do is cover it and let it ferment for 3 weeks. This produced an unbelievably flavorful sauce. The sauce, however, was a little thin for my tastes (too much water) and was not as hot as I wanted. Nevertheless, I am now hooked on making my own hot sauce and my friends loved their Christmas Gifts. 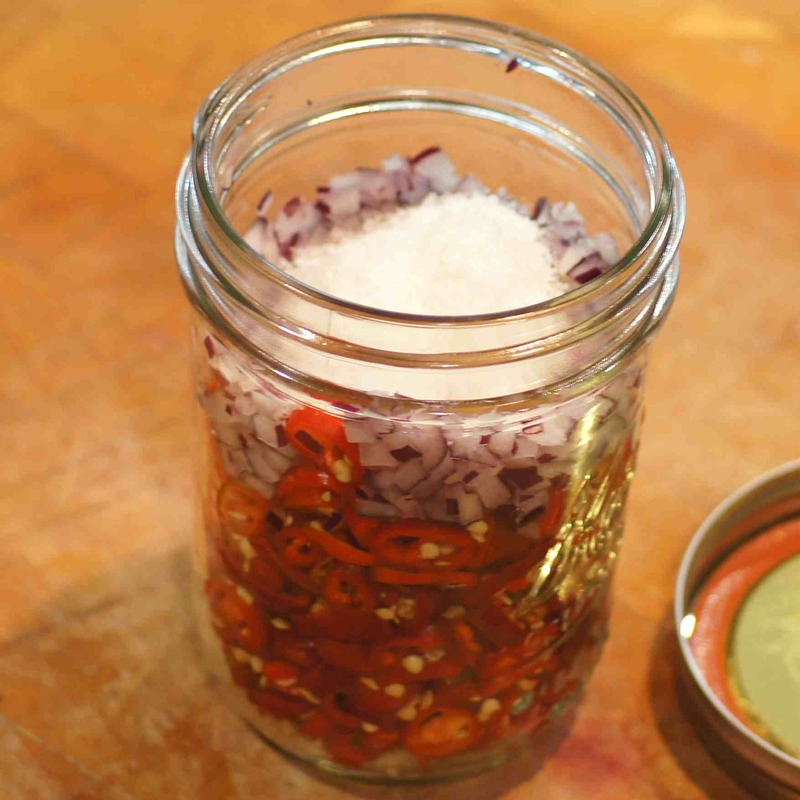 😀 We hope we have inspired you to experiment with your own pickled hot sauce. Well, I bottled the 4th batch of this hot sauce today and let me tell you, this is the best one yet! Put everything in a sterilized pint jar. Add bottled water to cover. Leave 1/4 – 1/2″ head space, place lid on top and tighten down. Now, someone in the comments asked me what to weight the veggies with to keep them submerged. You don’t. When you pickle veggies in brine, the veggies will release their own water. By leaving the head space, the liquid from the veggies are released and fills the void. Also, as the veggies pickle in the brine, they release CO2. Between the CO2 which is heavier than oxygen and the liquid released from the veggies, you establish an anaerobic environment (one without oxygen) which inhibits the development of mold & yeast. These are good things. 🙂 Now, like all of the other batches, let it sit for 2+ weeks. The longer it sits, the more it will sour. I let this batch sit for 2-1/2 weeks. I then put this in my Vitamix blender. 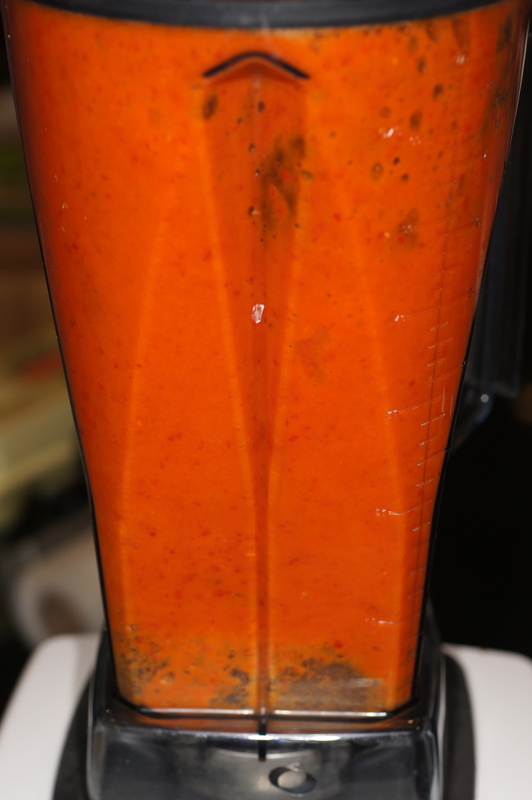 You really need a very powerful blender to completely liquify the veggies and skin of the chiles. I also did not strain this one as I had the others. This had a wonderful flavor and was very thick. Because it was so thick, it need to be thinned somewhat but not a lot. Obviously, more water was simply out of the question. Because Baby Lady really likes the vinegary flavor of commercially produced hot sauces, I decided to add 1 Tbsp of rice vinegar. I chose rice vinegar because it is a lower acidity vinegar and has a milder, sweeter flavor. The result is truly remarkable. It is like nothing you have ever tasted in a commercial hot sauce. It’s thick enough to adhere to whatever you use it with be it eggs, fries, fish, whatever. 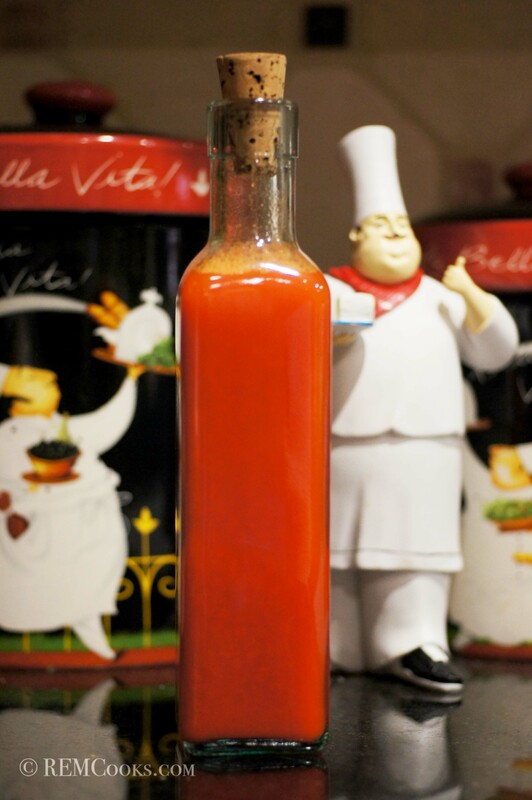 You can look at the bottles and tell how thick the sauce is; yet it’s not too thick to prevent it from pouring well. It has a full, robust, spicy chile flavor coupled with the flavors of the onion, garlic and salt with a nice tang from the natural fermentation and rice vinegar added at the end. Hopefully, you will try this and give it your own spin. If you do, let us know what you did and how you liked it. I just started another batch. We had our first freeze warning so we picked the peppers remaining on the plant. I had hoped they would all turn red but if it actually froze (it didn’t) and I left them on the plant I would have been very upset with myself. 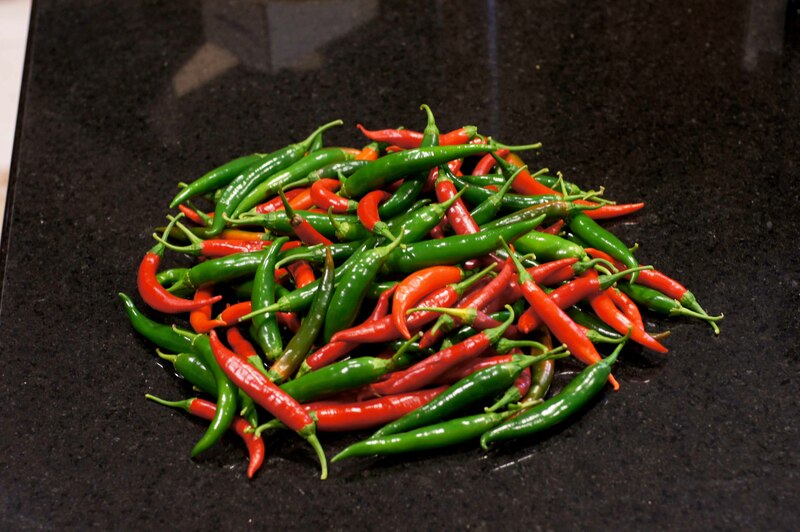 Here is the bounty of the cayenne pepper harvest – approximately 2 lbs of chiles. We also harvested the few New Mexico Greens (Big Jim) we had, some guajillo chiles, some remarkably mild jalapeños and some serranos. These chiles, however, will be used for something other than hot sauce. Now, these ingredients are for 1 lb. of cayenne peppers. Inasmuch as I had 2 lbs of cayenne peppers, to make the batch of red and the batch of green, the recipe is doubled. Put everything into a 2 qt jar. I like to layer everything because I put it in the jars as I go but you can do it anyway you want. Remember, in the end you’re going to run it all through a blender anyway. Put the lid on tightly and place in a dark place for 4 weeks. I actually waited 5 weeks this time. This made 6-1/2 cups of red and 7 cups of green. Very tasty, indeed. Once you try this, you may never buy hot sauce again. I won’t. This will probably be my last update on this post. I have continued to experiment with the technique. I have used more onion, less onion, different herbs and spices, and longer fermenting time, etc. I have varied the fermenting time to 6 weeks, 8 weeks and 12 weeks. 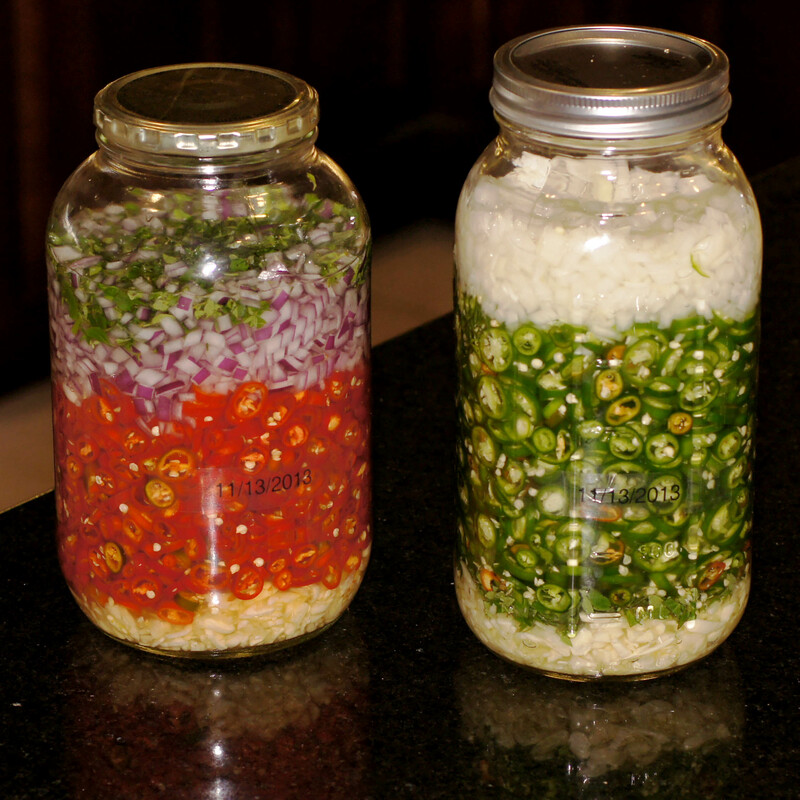 The last batch was almost entirely diced green cayenne peppers and fermented 12 weeks. After 12 weeks the mash developed an unpleasant aftertaste and I threw the whole batch (2 Qts) away 😦 . I find that the best flavor from this technique comes with 6 weeks of fermentation. 2 weeks of fermentation is fine and will provide you the flavor of the cayenne pepper with little to no sourness/tang from the lactobacillus. Acidity/tang can always be provided with the addition of a little vinegar at the end. 4 – 6 weeks of fermentation develops the sourness/tang from the process and anything after that begins to develop an off-putting aftertaste. If you try making your own hot sauce using this lacto-fermentation technique we would love to hear about your thoughts, process and results. I’m a chilehead too! Hubs and I are always on the lookout for a good hot sauce, but it never occured to me to make my own (doh!). This looks great BUT we live in the Caribbean so it’s really hard to find a cool place in our kitchen. Any chance I could ferment this in the fridge or is that too cold for the delicate bacteria? Lovely one Richard. We have two chili fans in the house and two wimps. Not a good combination. Thanks, going to give this a try. 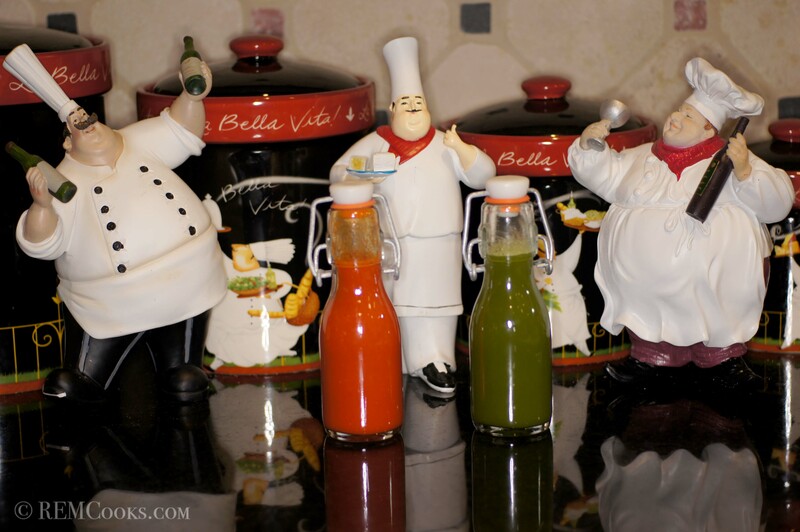 Oh, by the way….love the Chef canisters and statue. I’ve ordered a few statues for my kitchen decor as well. Thanks for dropping by and commenting. We found the little statues at a store called Harvest Ridge. I fell in love with them when I saw them. We have roosters and little Chefies all over the kitchen. I have a garden full of a hot peppers of all kinds, and was looking for a pepper sauce recipe. This one sounds perfect! Thanks, Patty. We love to hear from Chowstalker and are delighted you like our food. 🙂 If you try the recipe, let us know how it you liked it. Oh this looks great. Keeping these recipes! It definitely makes sense to chop hem, especially since you blend everything up! 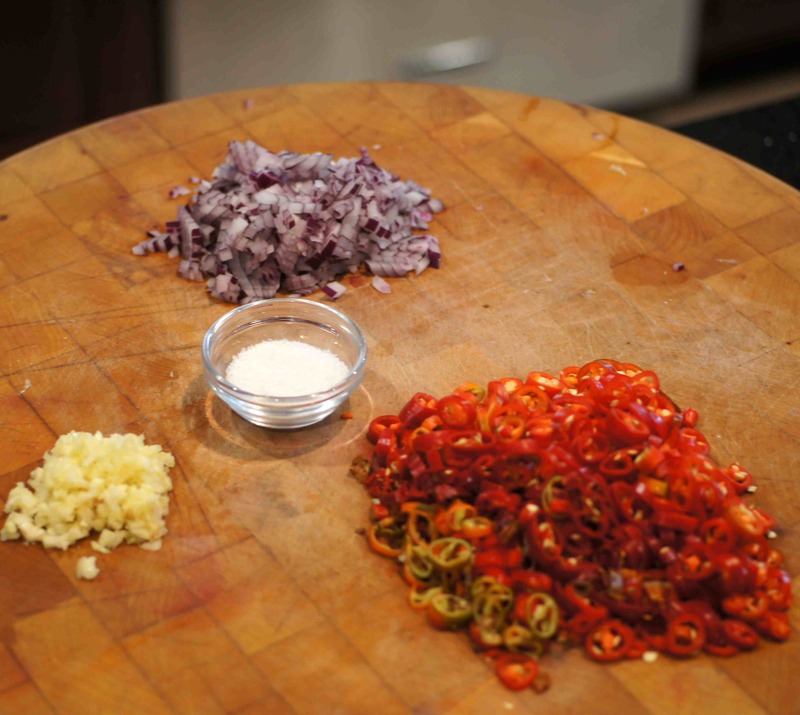 I will be making this pepper sauce recipe! Mimi, check out the 2nd Update about the 4th batch. If you are going to make it, this is the one to follow whether it be green or red. Hi! I just found this recipe on Pinterest and I must say that it sounds easy, tasty and perfect for me to make for my husband but I have one question- what did you use to weigh down the chilis in the quart-sized jar? I haven’t made my own hot sauce before so I’m looking forward to trying this out! Thanks for your help! One last thought, if it smells bad, it is. I have yet to have a batch go bad but there is always that possibility. Great idea updating a previous post Richard. Particularly this post. I laughed as I read the first paragraph, with an image in my head of you humming this to yourself as you decide on the brine, the rice vinegar and other ingredients. Lovely stuff and yes that lat photo is definitely a keeper. 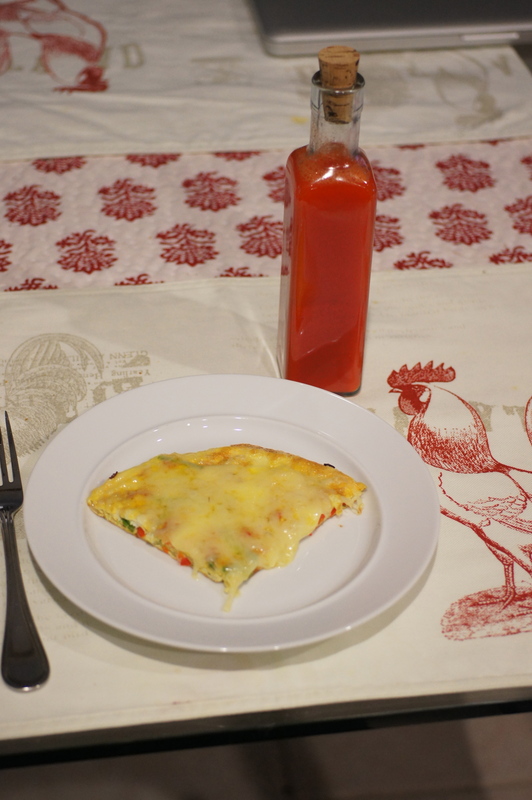 I tried the top(original) recipe and it turned out really well. I want to try it on everything! I put some on/in some boiled spinach from my garden with some butter and salt and pepper and it was really tasty. I have more peppers and I’m wanting make more but I have a question. How long does it keep in the fridge? If I make a bunch will it go bad before I can use it? Should I can it or does that mess with the flavor? Thanks. Hi, Ryan. Thanks for checking us out. We’re glad you enjoyed it. As to your question, I haven’t been able to keep the red very long at all. It’s always gone in less than 6 months. Now, I have some green that has been in the fridge for a year and it’s still very good (just too thin for my liking). It’s a live culture (so it’s actually good for you, i.e. yogurt) but refrigeration slows the process. It will, however, change the flavor over time ever so slightly. You should be able to can it but I have no idea what it will do to the flavor. Also, I’m not certain there is enough acidity to keep it from spoiling over time unrefrigerated. If you do can it, let me know the results as I am very curious. Don’t take the post down whatever you do. I’ve been coming back and seeing your updates every year when I’m making my hot sauce. This has been fun experimenting. I’m about to start a batch of with red cayennes but I am putting in a couple red jalapeños and one big red bell. I’ve found that the different varieties of peppers add more depth of flavor and a slight sweetness that we’ve enjoyed. I also agree that 3 to 4 weeks is the best. We made a huge batch last year and gave it to our friends and family for Christmas. Thanks Ryan. I doubt I will ever take the post down. I just won’t do any more updates unless I fall upon something that is really different. I’ve thought about using some food grade wood chips, i.e. oak, and trying that with the fermentation process to see if it makes a difference. Sadly, our chile production was significant.y off this year with all of the rains we had in May. It has been such a poor year we have yet to harvest any chiles. 😦 Perhaps this Fall will provide us a good yield. Also, I never tried canning it but it has lasted over a year in my fridge. It may get a little spicier but the flavor and look are still good! Lorin, which version did you try??? I’m actually working on another batch right now from more homegrown cayenne chiles. It has been fermenting for 3-1/2 weeks. I have never had a problem with this recipe. Did you use tap water of bottled water? How high did you fill the jar?? There must alway be head space because the chiles macerate in the brine and release their own liquids. Also, I don’t tighten the lids down super tight, just snug. The fermentation process does produce CO2. If you tighten the cap too securely it will not allow the CO2 to escape which would cause the brine and contents to become carbonated, i.e. champagne made in the bottle. Another factor could be temperature. Fermentation is best between 68 – 75 F. Too high of a temperature can cause the fermentation process to go awry. If it were bad, it would have reeked. Nevertheless, I never play loose and free with foods and probably would have thrown out the batch, as well. Thanks. I used bottled water, but I don’t think I left enough space in the bottle. I’m trying another batch today. It smelled fantastic. The garlic was very strong. Should I not tighten the lid too tight? I just snug the lid down but not as tight as I can get it. The release of CO2 is highest in the early stages of the lacto fermentation process, i.e. in the first 3-4 days. My guess is you tightened the jar to tightly and did not leave enough headroom. On a couple of batches I had some seepage. Now, I put a small plate underneath the jar. If the sauce goes bad you will definitely smell it. Also, you will see the liquid become discolored and perhaps some whitish scum. The garlic in the last batch was VERY prevalent but oh so tasty. The beauty of this recipe is its simplicity AND you can play with it to get the flavors you want in a hot sauce. Let me know how your second batch turns out. Just wanted to know that we tried the 2nd recipe with dried red cayenne and pequin chilies with a few dark green over ripe jalapeños. After the 2 week fermentation period, we puréed it and served it with our chili last night for our Halloween guests. It was a huge hit! The flavor of the sauce is like a fresh sriracha! We brew beer too so we are hooked on trying new variations of ingredients and fermentation times. Since we are right at our first freeze, we are gathering up all of our chillies to plan our next batches. Thank you for your creative approach and your great communication! Hi! I have also experimented with homemade hot sauce this year and it’s awesome! Your post is great! Curious how long you keep it in the fridge for? I was going with about 3 months. I am the kind that worries about getting sick from it spoiling but I was feeling like it could have lasted longer? Hi Allison, hot sauce doesn’t last long at our house. The last batch has been in the refrigerator for a little over a year. We tried it the other day on eggs and it was still quite tasty. I just blended my first batch after 6 weeks of fermentation using the update at the bottom of the page. It is waaay too salty for us. I’m starting on pickling batch #2 and will cut down on the salt.